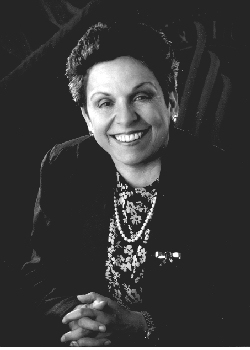 Donna Shalala was born in Cleveland, Ohio. She received her bachelor's degree from Western College for Women in 1962, and her master's in 1968 and Ph.D. in 1970 from Syracuse University. After graduating from college she volunteered for the Peace Corps and spent two years teaching in Iran. During 1966-1970, she served as assistant to the director of the Metropolitan Studies Program, lecturer in social science and assistant to the dean at the Maxwell School of Citizenship and Public Affairs at Syracuse. In 1970-1972, she taught political science at Bernard Baruch College, and between 1972-1979 taught politics and education at Teachers College, Columbia University. From 1975-1977, Dr. Shalala served as Director and Treasurer of the Municipal Assistance Corporation for the City of New York. In 1977-1980, she served in the Carter administration as an Assistant Secretary at the Department of Housing and Urban Development. In 1980, she assumed the presidency of Hunter College in New York City. Dr. Shalala was made Chancellor of the University of Wisconsin in 1988, and served in that position until 1993 when President Clinton appointed her Secretary for Health and Human Services.